GALION — Water, water everywhere. Ohio’s up-and-down weather in recent days has led to water woes in the city. Last weekend’s storm dropped up t0 12 inches of snow in the Galion area, which according to the National Weather Service equates to about an inch of precipitation. Two days later, this area received more than a half an inch of rain. Accompanied by warmer weather — which reached into the 40s — and frozen or saturated ground, the snow-melt and rain led to lots of ponding water in Galion and beyond. While snow drifts have gotten smaller in recent days, and the rain helped to clear salt, snow, ice and other storm-related debris from roads and alleys, it also caused other issues. On Thursday, as temperatures dropped to below freezing again, water remaining on roads and sidewalks and parking lots started to freeze again, making for slick driving conditions. The topsy-turvy weather has also resulted in soil freezing and expanding and thawing and shrinking again. All of that phenomena has led to water main breaks in Galion and other communities. There was a break on North Columbus Street on Tuesday. It was fixed in just a few hours, but resulted in a water boil advisory for 24 hours. On Thursday morning, another water main broke on East Church Street. It too was fixed in a matter of hours. And it’s a certainty that Ohio’s up-and-down weather will continue, at least through next week. That also means more water main breaks are likely, which translates into more inconveniences for Galion-area residents and City of Galion workers. Friday’s frigid weather is just the latest weather change. Ohio is in a pattern that will cause weather to change every few days for at least the next couple days. It will warm up a little this weekend, followed by snow early next week that could total 3 to 5 inches. And then another arctic blast will dip into the midwest, resulting in what could be the coldest temperatures in this area in at least two years. Photo by Erin Miller A water main broke Thursday morning on East Church Street in Galion and was fixed by City of Galion workers within a few hours. It was the second break in three days. With more thawing and freezing on the way through the next week, there a good chance of more breaks in the city. 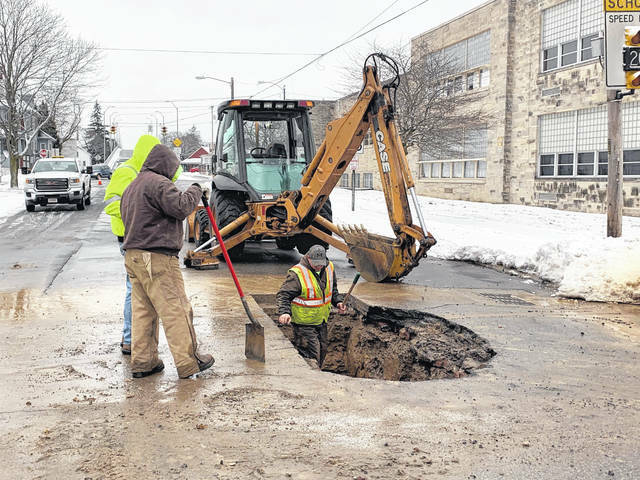 https://www.galioninquirer.com/wp-content/uploads/sites/38/2019/01/web1_Water-main-east-church-street.jpgPhoto by Erin Miller A water main broke Thursday morning on East Church Street in Galion and was fixed by City of Galion workers within a few hours. It was the second break in three days. With more thawing and freezing on the way through the next week, there a good chance of more breaks in the city.